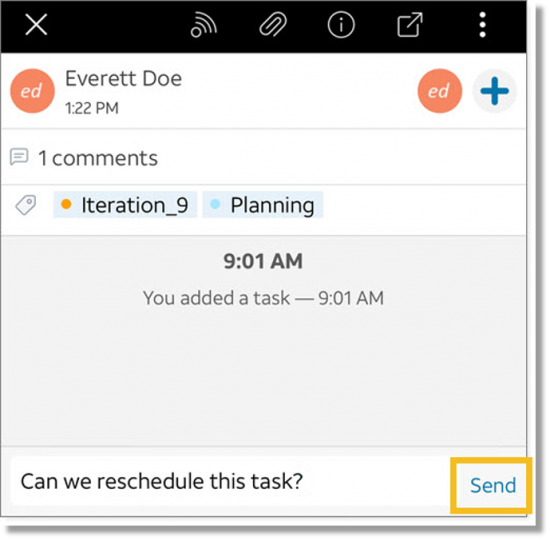 You can use comments to keep a record of conversations between team members about a note, file, or task. You can edit, copy, quote a comment in a new comment, and delete comments. You can convert a comment into a note or task. When someone responds to your comment, AT&T Collaborate notifies you in the app and by email. If you reply to an email notification, your reply is added as a new comment. In the panel at the upper-right, click the Notes, Tasks, or Files icon, depending on the type of item you want to comment on. A list of notes, tasks, or files appears. Click the item you want to add a comment to. The item details tab appears. In the panel at the upper-right, click the Notes, Tasks, or Files icon. A list of notes, tasks, or files appears. Click the item that has the comment you want to edit. The item details tab appears. In the comments section, hover over the comment you want to edit until the Actions menu appears. Edit the comment, and then click Save. Click the item that has the comment you want to copy. The item details tab appears. In the comments section, hover over the comment you want to copy until the Actions menu appears. Click the Copy icon . The comment is copied to the clipboard. Click the item that has the comment you want to quote. The item details tab appears. Click the Quote icon . The quoted comment appears in the Messages panel, attributed to the original author and including the date it was originally added. Click the item that has the comment you want to convert into a note. The item details tab appears. Hover over the comment you want to convert, until the Actions menu appears. Click the More icon , and then click Convert to Note. The comment appears as text in a new note window. Edit the note, click Publish, and then close the window. The comment appears as a note. Click the item that has the comment you want to convert into a task. The item details tab appears. Click the More icon , and then click Convert to Task. The comment appears as text in a new task window. Edit the note, click Publish, and then close the window. The comment appears as a task. Click the item that has the comment you want to delete. The item details tab appears. Click the More icon , and then click Delete. In the panel at the upper-right, tap the Notes, Tasks, or Files icon, depending on the type of item you want to comment on. A list of notes, tasks, or files appears. Tap the item you want to add a comment to. The item details appear.